Ten sheets of decal transfer paper. Instructions for creating your unique decals, applying them and firing in your kiln. 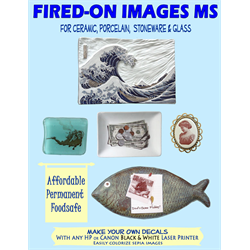 Decal paper, or transfer paper, works exclusively with HP or Canon B&W laser printers to put any image you can create or find on any piece of pottery. 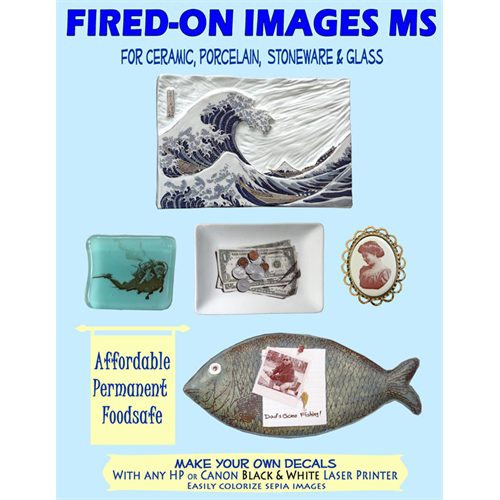 You only need 3 things to fire on your own decal images: An HP or Canon Black and White laser printer, Fired-On Images Transfer Paper, and access to a kiln. First, find any image from your personal collection on your computer and print it out on the decal paper. Once the decal begins to separate from the paper backing, remove it and slide the decal on to your surface. Position the decal and blot off the excess water, and wait an hour or so for it to completely dry. Fire the item in your kiln and you have a permanent image fired onto your item. Q: Will this work using my (any brand except HP/Canon) laser printer? A: No. The toner in HP and Canon printers contain iron, which ultimately leaves the final brown decal image. All other brands, including store brands and refill kits, will not work properly. Q: I have a Color HP/Canon Laser Printer. Will that work? A: No, the printer must be black and white printing only. Color toner will not work. Q: Can I put the cup/platter/plate with the final decal image in a microwave oven? A: Yes. As long at the original item was microwave safe, it still will be. Q: Is it food safe? A: Yes. It will be as food-safe as the original item. A: Yes. It will be as dishwasher safe as the original item. Q: Will this work on glass? A: Yes, the firing instructions are different, but the image will transfer to both glass and ceramic. Q: Can I apply these decals on top of any fired glaze? A: Yes. You may have to experiment/test-fire to determine the correct firing temperature for your specific glaze(s). Q: What color are the images created with these decals? A: Once fired, the decals leave a rich sepia brown-colored image. Q: What is a decal? A: An image which has been printed on a transferable medium.